McStrong Safety Services provides traffic control and a complete range of safety services. Alberta Occupational Health and Safety defines COMPETENT as: adequately qualified, suitably trained with sufficient experience to safely perform work without supervision or with only a minimal degree of supervision. Webster’s defines EXPERT as: having, involving, or displaying special skill or knowledge derived from training or experience. One of the first flagging companies in the Alberta private sector, we take supreme pride in what we do and strive to achieve safety practices that exceed regulations. At McStrong Safety Services, we remain the competent traffic control experts in Alberta. 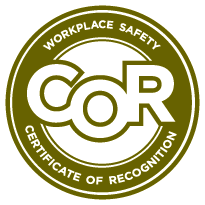 Our team is certified by the Alberta Construction Safety Association. Contact McStrong Safety Services today to talk about your safety needs. Let us help you bring the importance of safety to the forefront of your business. Our loss prevention and security services include site patrols, emergency management and more. Our employees have the training and skills to provide superior safety services for your business. We provide various online and classroom trainings for trip inspection, cargo securement and more.